It’s a good example of squandered potential, may have to seek out the manga if it gets more translations. Not seen Radiant, but several of the others I enjoyed. MonMusu and School-Live!, Konohana Kitan of course. I didn't even mind Danganronpa, I felt there were a lot worse game adaptations. AssClass I never got round to finishing but was good as far as it went. Similar with Magical Girl Raising Project. As far as adaptations go they're reasonably faithful without being slaves to the source material and I don't have any complaints. But I don't have the most discerning palate, really. Certainly MAL EDIT: hasn't got it in their database. According to wiki it's a Manfra, a comic from France in a manga style. And Hakumei and Mikochi. Haven't seen too many people talk about it, possibly because it's on HiDive. But if you like, as you seem to, SOL stuff I definitely recommend it. Certainly MAL has got it in their database. According to wiki it's a Manfra, a comic from France in a manga style. Just realised that should have been "MAL hasn't got it on their database." Being a Diclonius is brutal and tragic, baby! Don’t drop your mobile around this one, baby! Elfen Lied certainly borderlined on being excessively tasteless and cruel at times, baby! Just don’t do it with people around you, baby! Got Yuri is My Job 1 and The Devil is a Part Timer novel 11 on the way from Amazon. 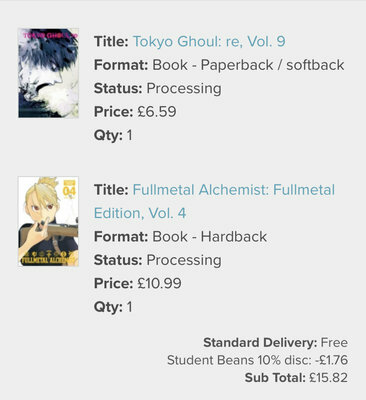 Considering the prices between the online stores were practically the same I decided to go ahead and place my order for the Smartphone series. I haven't watched the anime yet but I wanted to own it regardless. Was going to wait until Death March got released and order them both together but I figured I'll get it now in case the conversion prices go up. Star Blazers 2199 was almost ordered alongside this but I decided to hold out in the meantime. I had to hold off on this set during the Christmas sale but I'm happy to see that it went back on early bird once again. It's now estimated to arrive at the end of the month which is neat. My main concern is that apparently the entire set is subtitled only, when Kick Heart I believe actually got an English dub (heck it even aired on Toonami). I wish MVM would release Apocrypha and do a box to hold both parts like they did with Zero.